Spindletop paused for a moment and scratched her head as she gazed at the remarkably nondescript shape of the glowing humanoid dancing reward the edge of the cliff. She wasn’t exactly sure why Mira had chosen to create her apparition closer to the nefarious compass collectors, rather than further off as they had discussed. However, Mira had shown that she was very smart and Spindletop had every confidence that if her BTFF had chosen to deviate from the plan, she must’ve had good reason. With a quick shrug, she turned back to the work at hand. A short, sharp tug set the wooden stopper loose to hang from the leather thong that attached it to the side of the wineskin, swinging like an irregular pendulum. The elven mead quickly poured outward, a tiny golden fountain pooling up on the ground below and forming tiny rivulets that reached out, liquid fingers probing the surface of the earthen floor for contours by which they could travel ever further out. Spindletop looked on in pride at her own handiwork. Part of her wanted to stay and see the device fulfill its designed purpose - not to be certain it worked, of course. Of that she felt absolute certainty. Rather, she simply wanted to hear what it would sound like when it went off. But, the curious kender was also keenly aware that their goal was to liberate the captives within the cave. She wasn’t sure if she would be able to catch up with Joey and Marcus before they entered the cave, but she could certainly give it a shot. unobtrusively as she can manage. Last edited by rhaiber; 04-23-2019 at 02:03 PM. Alerted: And Now What? Both Veranda and the Ifrit converged near the dancing lights, just as they started to float away from them. The Ifrit was about to follow the dancing lights when Veranda stopped him, "Clearly, a distraction, Canter. And I thought you were a clever boy!" Veranda mocked him haughtily. She continued, "Some sort of light spell or something or other. Trivial stuff..."
The sudden sound burst through the night air. Ironically, Veranda was so startled, she nearly jumped into Canter's arms. Now it was the Ifrit's turn to mock the Drow. "Who's the chicken now?" Canter laughed in return, "You were spooked worse than those poor plubans we jumped earlier!" Veranda blushed angrily, but lifted her chin in an arrogant indignation. She began to march off towards the sound of the wineskin, as if to suggest that she was not scared of anything. "No need to get fussy about it, Veranda, it was just a joke..." as Canter's giggling died down, he followed off after the Drow, in the direction of the noise. The companions' plan seemed to be working, at least for now. OOC Plan continue's to be a success! Remember, that moving requires a stealth check each round. Please indicate where you move to next and make sure to roll stealth when you move: they're looking for you now! Stealth: if you decide to move, I will need a stealth check for any distance you decide to go. Assume that we're in combat for the purposes of moving (i.e., you can take a movement action and a standard action) and indicate where you want to go in your next post. Marcus may have been in the bushes beneath the bluff here and now, but in truth, he was far away, and years in the past. "Kom ut, kom ut hvor du er." To be seen was death. He wasn't supposed to be this far into the frozen citadel, but his sister had forgotten to return her latest tome of tales. The Keeper would, no, had, noticed its absence. No sooner had Marcus laid the book back on its shelf than he felt the temperature drop twenty degrees. He couldn't fight it. He could only hide. "Kom ut, kom ut hvor du er." The boy's breath came out in thick mist as he shivered behind the tapestry. "Jeg er ikke sint liten." He knew it was lying. It was always angry when the children made it this far without permission. If discovered, he'd be lucky to end up in the deep mines. He had to keep quiet and hope it gave up. He peered from behind the heavy cloth and caught The Keeper's silhouette against a bookshelf. He was about to run for it as The Keeper shreaked and jumped into a pair of invisible arms. Marcus looked around and saw Spindletop, Sam, and Shiara looking over him. "You're not alone." They said in unison. Grandmaster Thumpkin's toad looking face joined the mix. "But among you are those who are ready to take that journey. You are your own unique individual. Show us what you have that makes you a Hero!" His sister's face appeared next. "You can do this, you can save us all." Marcus clenched his fist and forced his eyes closed with enough force to stop the tears streaming down his face. "I can do this. I have to do this." He gestured to Joey who'd stayed mercifully quiet during the boy's breakdown. "We can do this! Let's go be big darn heroes!" Mira briefly panicked when the Drow saw through her illusion, then nearly jumped when Spindletop's contraption went off even though she knew it was coming. At least that really spooked them. The kitsune girl relaxed a little, thinking their little surprise plan was a success afterall - then froze again. Now what? She looked back at others who were hiding behind the other bush, trying to see what they were doing, realizing she had no idea what the actual plan after the surprise part was. Am I supposed to remain hidden? Do we try to subdue them? Mira began to sweat watching the Drow get closer to the contraption, frozen in place and not knowing what to do. OOC Mira stays still in her spot. Spindletop looked on (or rather listened to) the results of her handiwork with delight. Of course she’d been certain it would work, but she wasn’t entirely certain what it would sound like. She decided that the resulting cacophony was something like the sound of a dragon suffering from indigestion brought on by eating a herd of cattle and only discovering after the fact that he might actually be lactose intolerant. Her sense of satisfaction was short-lived however, as she noticed Mira frozen as still as a statue, startlingly close to the path that Rose and Frito were taking on their way to investigate Spindletop’s “Distraction of Draconic Digestive Disturbance” (the name had just come to her, and would definitely be the way she would refer to it in all future stories). ”Great Fizban’s beard!” Spindletop muttered under her breath. Her kender mind had a tough time understanding why anyone would stand still in one place under normal conditions; to do so in the middle of a plan to sneak past a group of particularly-not-nice people - well that didn’t make any sense at all. And yet, all of these big folk seemed to be stuck in molasses (which might’ve gone nicely with the pancakes they’d had for breakfast). Taft and Ellie hadn’t moved at all since they got here, and even Marcus was sure taking his time getting into that cave to start the whole rescue operation. But it was Mira that she was the most concerned for. It was bad enough that the compass collectors had so quickly dismissed the kitsune’s amazing light show. If they stumbled upon her, it would ruin the whole purpose of their carefully orchestrated distraction. Even though the Distraction of Draconic Digestive Disturbance seemed to be doing its job, it certainly wouldn’t keep their attention once they discovered its source. Spindletop had to think of something else to keep the perfidious pair preoccupied, and maybe even draw them further away. Reaching into her coat, she swiftly drew forth a pair of glass vials (currently empty. She’d been hoping to find something interesting to put in them, but she resigned herself to sacrificing them for the greater good. She hoped that they might be able to feel satisfied with having served some good, even if it was unrelated to their intended purpose), gently cradled them both in the sling of her hoopak, and with a swift flick sent them sailing as far as she could manage towards the west of where she currently crouched. She wasn’t aiming for anything in particular, but felt confident that with enough force, they should shatter no matter what they ultimately hit, and the resulting crash should serve to increase the chaos and confusion. Free Action: She draws glass vials as ammunition. Standard Action: She launches the glass due west past the edge of the map, but within earshot. She has no specific target, so I don’t know if you want an attack roll just to make sure she doesn’t royally screw this one up and miss her intended range but here goes. Last edited by rhaiber; 04-23-2019 at 02:04 PM. Alerted: And Now What? Veranda and Canter scanned the area, but seemed to see nothing. Then the sound of tiny glass shards sprinkled deeper in the woods. The two look at each other seriously, deciding that they should perhaps split up to look deeper into the woods. Spindle's plan was working perfectly. Meanwhile, Joey and Marcus successfully make it to the cave entrance. The opening was large and looming. No light emerged from the cavern. If the other students had indeed been left in there, they must have been forced to endure a total darkness. Joey nods at Marcus, gesturing towards the cave. Though neither of them could see in the dark, it was too risky to light a torch at the entrance. They would have to feel their way deeper into the cavern if they wanted to make light and not be seen. Outside the cave, Ellie beckoned Mira to come towards them. She points towards to a tree Q18just southwest of them. "Look over there," Ellie whispers. It took a moment for Mira's eyes to make out what Ellie was trying to show her, but it eventually becomes clear: a shadowy figure was climbing down a tree. As the young man reaches the bottom, it suddenly dawns on Mira. It was Ragli. I didn't have the time to fully update the map: Ragli is at Q18. Last edited by dalarangreen; 02-22-2019 at 11:22 PM. Marcus, breathed a sigh of relief as he entered the cave. Joey may not like it, but the darkness brought a particular comfort to him. The naive notion of I can't see them, so they can't see me, lent courage to the boy. There would be time for logic later. One hand on the wall, and one on Joey, the pair moved further into the cave. The pair halted as Marcus strained his hearing for any signs of the captured students. Shouldn't be too hard, they dont have much reason to stay super quiet. He thought about calling out to them but worried their guardians would hear first. He feared that Veranda would catch him most of all. No need to push their luck any further when it had already brought them this far. I'd like to double move (at quarter speed because of sneaking while blind ~_~) from D-12 to D19 assuming the cave goes straight back that is. Mira suddenly felt clear-minded when she saw her bunk-mate from the Orta and then the ex-teammate. Instead of panic, anger began to rise from deep within. Everything went wrong because of Ragli. As she stared at the shadowy form of Ragli, her golden eyes seemed to darken in hue and her long crimson hair seemed to writhe down her back. Within few seconds, short red, white, and black hair covered her entire body, and her nose and mouth elongated to a pointy snout - she was in her true kitsune form. The fact that she was taught not to show her true form in front of other humanoids unless she knew them to be fully trusted, was forgotten behind the anger she felt. In fact, she didn't even realize that she was now in her true form, as her focus was on Ragli at the moment. But when she unconsciously stepped forward and a dry tree branch broke under her foot, snapping with a loud noise, she came to her senses once more. "Shoot!" Mira looked around hastily and without a second thought, started moving quickly away from the cave. She couldn't endanger everyone, because she couldn't keep quiet and almost gave in to her anger. She looked back at others still hiding in the bush, silently mouthing, 'I'm sorry.' as she ran back towards the woods. OOC So..yea, rolled a 1 for Stealth. Mira used action to return to her true, fox humanoid form, and will use her 30' of movement to go South. Last edited by ElvenMaiden; 02-25-2019 at 11:19 PM. Spindletop froze as her keen Kender ears picked up the the crack of branches snapping under Mira’s feet. Her eyes darted first to the pair whom she had previously dubbed Frito and Rose (though apparently Rose was actually going by Veranda - even though that name didn’t really seem to suit her. It conjured images of palatial manor homes - the kind with wrap-around porches and ladies in voluminous dresses lounging in wooden rocking chairs while sipping mint-flavoured liqueurs. And that just didn’t seem like her (admittedly, she had only just met the dark elf - and not even properly met her at that - but still, Spindletop was usually a pretty good judge of character and had a feeling that she wasn’t the fluffy dress, rocking chair, mint liqueur type … that is, unless she was the type who was born into that type of life, but found it too confining and rebelled against it, running away and maybe even changing her name to hide from her past. And if that was the case, then Spindletop had the perfect suggestion for an alias she could use!)). Hopefully those two were busy enough already investigating bagpipes and broken glass to concern themselves with a clumsy kitsune. Spindletop felt considerably less confident that the newest arrival to the scene would be similarly preoccupied. Though she had never seen him before, she guessed from the others’ conversation that this might be Ragli. Still, aside from this name, all she really knew about him was that he liked to climb trees … apparently? If he was Ragli, that would mean he’d already met Mira and might recognize her … but then again, she had just shifted her appearance into the form of an even foxier lady (which, again, was super cool. Mira was definitely the best BTFF). With any luck, that might throw him off. Like so many of her kind, Spindletop was possessed of an indelible sense of self assurance along with an uncompromising optimism that together left her wholly confident that everything would work out okay for her. However, this did not prevent her from feeling concern for those around her whose fates were less certain. In fact, it was this very reason that motivated Spindletop to intervene when she saw that Mira was dangerously close to losing the quiet game. Her hand gripped tightly about the spider-stone thingy in her pocket as she attempted to assess the situation. So, this is a bit complicated, but Spindeltop intends to hold her action based on how the unfriendlies react to Mira’s stealth fail. If they somehow seem not to take any notice of Mira, then Spindletop will continue to hold her readied action to use the spider-stone thingy. Despite the darkness, Marcus finds that he can navigate the cave surprisingly well, mostly by feeling around in the darkness and using his sense of touch and sound. Maybe it was all of those years he spent enslaved and trapped in the desolate cold of his home world... There was a small stream running along the floor on one side of the cavern, but beyond the trickling of water from the previous nights rain, Marcus hears what he thinks are whimpers from further down the caves corridor. Joey puts his hand on Marcus' back, unable to see further into the cave. "You lead the way and I'll follow," he whispers. Outside the cave, Mira has attracted the attention of the captors. "Well, what do we have here? Canter, I found a rat!" Veranda eyes the young kitsune through slitted eyes, "Or, more like a fox, it seems. Pardon me, for being a tad bit impolite. Now tell me dearie, what are you doing all by yourself here in these woods? You didn't happen to get lost did you?" Ragli for his part, seems to be taking the current scene in with a sense of amusement. He stays hidden from his companions, and seems to be circling around behind them through the woods. However, it is difficult to keep an eye tracking his movements. OOC Perception Check DC14 to keep an eye on Ragli's movements. Veranda and Canter rhaiber, please include your interrupting speech in your next post. are approaching cautiously. I didn't have the time to update the map. Spindeltop breathed a quick sigh. No one seemed to have recognized Mira. At least they had that going for them. But the young kitsune seemed to be caught like a deer staring into a bright lantern. Someone had to get in there and help her out before things got any worse. Luckily the fox-girl happened to have a BTFF nearby who was just the right person to fix this whole mess. She just needed to make sure that the decidedly-not-nice crew didn't see them as any sort of threat. That way they were likely to proceed slowly and cautiously rather than becoming aggressive. Having never met any of this lot before, Spindletop felt certain that her part of the tale was totally believable. And offering up the possibility that they might get their hands on another of the coveted compasses ought to grab their attention. Since they had previously employed deception to get the other groups' compasses, it seemed a safe bet that if they saw a gullible, easy mark, they would probably adopt a strategy of careful manipulation rather than attacking her outright. That was good. That would certainly help her to stall for time, at least long enough for Joey and Marcus to free the captives. bluff to draw attention away from those still hidden and to convince the compass collectors that she and Mira are essentially harmless fools. Marcus' shoulders relaxed as he heard signs of life further into the cave. He'd feared they had moved the prisoners when they lost Tafel. Luckily they seem too caught up in that idol up there to keep an eye on their prisoners. The boy inched further into the cave, Joey's hand on his back keeping him grounded and brave. At least he wouldn't be alone if things went sideways down here. The only way out is through. The boy thought to himself as he continued further into the cave. Mira felt a growl starting to form from her throat and her claws extended slightly as she watched Veranda and Canter approach, then her focus was distracted by the small kender girl that popped out of the bush after her. Hoping the duo in front of them would buy Spindletop's story, Mira nodded her head while still averting her gaze to one side, seemingly in embarrassment. OOC She is trying not to talk or engage much to avoid looking awkward, but if still needed.. Inside the Cave Marcus and Joey make their way deeper into the cave. Following the sounds of muffled whimpers, they nearly stumble over a pair of captured students. Both seemed to have elven features, but it was difficult to tell in the dark. Both were lightly gagged as well. As the pair of rescuers approach, both elves eye's open wide with fear and apprehension. Who were these new individuals who had stumbled upon them in the dark? Intelligence Check: DC5 to recognize one of the two prisoners. DC10 Dex check to untie the bindings. Cutting the rope doesn't require a check. What conflict is to come? "Haha, more welps lost in the dark!" Veranda seems to be mocking the pair of young women, "Why don't you toss me your compass, little halfling, and I'll show you how to use it!" Canter looks disapprovingly at Veranda, "Far too naive, Veranda. Do you actually believe these plubans just happened to roam here in the dark? Either they are following the clues of the compass, or they were brought here by Tafl. I told you we shouldn't have let him go." "Empty worries," Veranda notes, arrogance clear in her voice, "I bet Tafl just sent them over here because he was too scared to try and acquire their compass himself." Canter, still not convinced by Veranda's comments, draws his shortsword. His voice drops to a softer whisper, "That's the kind of ignorance that got Lanthe a busted jaw yesterday, if you weren't paying attention. I, for one, am not about to get my face smashed in, especially not by a pluban. Why don't you tell us what that noise was earlier? What are you up to, squirts?" Canter looks at the pair of young women expectantly. He would get answers--at swordpoint if necessary. Spindletop is unable to keep track of Ragli in the chaos, but Mira's low-light vision helps her spot him, despite his attempts to sneak. He seems to be circling around his companions, hiding from both Canter and Veranda as well as Mira and Spindletop. 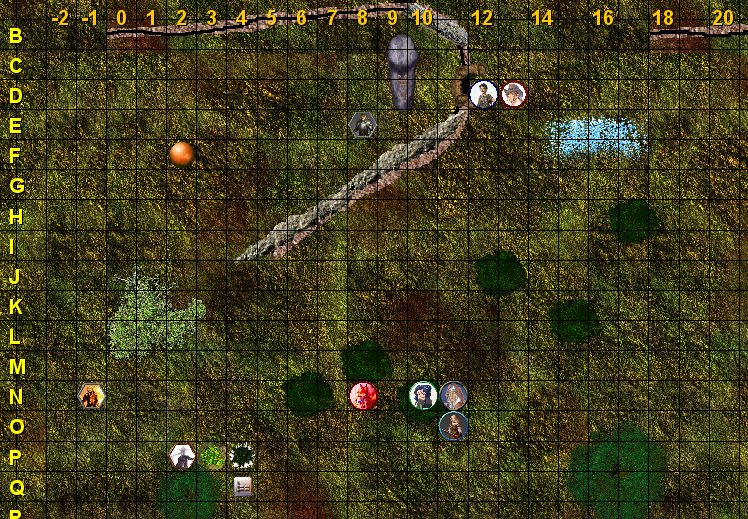 OOC I won't be able to update the map for a bit, so please let me know if you need map specific information. Canter looks threatening, but has yet to make moves to strike the pair. Spindletop’s unassuming and cherubic grin remained plastered on her face, as though she was entirely oblivious to the unabashed mockery in Veranda’s voice as the drow suggested to her, "Why don't you toss me your compass, little halfling, and I'll show you how to use it!" “Whew,” Spindeltop breathed a deep sigh of relief at Veranda’s words. On the surface, it was intended to convey her gratitude toward the drow’s offer of assistance in understanding the compass, but inwardly she was also glad to see that her performance seemed to be working, for now at least. “We are so happy for your help. Honestly I’ve had such trouble figuring this compass thingy out. Do you think it’s safe to toss? I thought it might be kinda fragile, and it certainly seems valuable, what with the supposed magic and all (though I honestly haven’t been able to figure out what makes it so magical - you’d think magical compass-thingies would come with some sort of instructions, wouldn’t you?) ‘Course I’ll be happy to hand it to you … that is once I remember where I put it. Y’see I don’t generally carry everything in my possession in my hands when I’m walking around. Frankly I couldn’t manage it on account of not having nearly enough hands. Fortunately I have a fairly sizable number of these fantastic inventions called pockets. “Say, did you know that it was actually a kender who invented the first pocket? Of course, humans like to take credit for it, but I find their claim to be sorta dubious. Historically humans only invent new things if they have the potential to hurt someone. I mean, phew, humans, amiright?” The gregarious girl exhaled a puff of air aimed at an errant wisp of violet hair that has somehow managed to dislodge itself from one of the tightly wound buns atop her head while cocking her head and winking in a conspiratorial manner that seems designed to engender a sense of camaraderie with her newfound friends (maybe-not-friends?). Her attempts to engage in a friendly exchange were hard pressed to break through the suspicious Ifrit’s walls though, as he continued to probe into her story, "Do you actually believe these plubans just happened to roam here in the dark?" મારી સાથે જોડાશો | મારી સાથે જોડાશો"
Though she still wasn’t certain if she had convinced Canter, the diminutive dragonophile felt that her words might have been getting through to Veranda. In any event, she remained confident that her circuitous string of nosequitors was definitely doing its job in providing Joey and Marcus time to free the captives. Hopefully they would be here soon. "Empty worries," the drow noted. Yeah, she was clearly buying Spindletop’s routine. "I bet Tafl just sent them over here because he was too scared to try and acquire their compass himself." Canter, on the other hand, drew his shortsword, dropping his voice to a whisper, "That's the kind of ignorance that got Lanthe a busted jaw yesterday, if you weren't paying attention. I, for one, am not about to get my face smashed in, especially not by a pluban. Why don't you tell us what that noise was earlier? What are you up to, squirts?" Last edited by rhaiber; 04-23-2019 at 02:05 PM.